Division or an (imperfect) unity? Just over 200 years ago, (in 1798) my namesake Henry Monro was hanged in front of his house in Lisburn, Northern Ireland for his support of a united Ireland. Son of a Presbyterian father and Anglican mother, he was a regular attender at Lisburn Cathedral. He was also on very good terms with local catholics, and they all often attended services in the Cathedral and the local Chapel, for Communion or Mass. He was highly respected for this, and his stance that Ireland should be united with ALL religions playing their part in governing it. This was to be his un-doing as he was a temporary Commander in the United Irishmen and was entrapped and summarily tried and executed. Fortunately they have moved-on and, whilst still divided by a nominal line on a map, much co-operation has been achieved amongst the various factions. They have learned to forgive (if not forget) their history, and have seen that a political and social life is possible even when differing political viewpoints are seen. I think there are very few people there who would want to return to the divisions of the past, and one has to commend them highly for this. Scotland has had a simmering element of Nationalism since the 1930s and almost a decade ago, power was achieved by them at Holyrood. There was an immediate and worrying sense of division in the populace; for and against independence from the rest of the UK. This was seen to be an ill-founded desire as in 2014 the populace voted quite strongly, and rightly in my opinion, to remain within the UK, and be politically attached. The SNP Government has steadfastly and stubbornly refused to accept this message, and appear to want to have another ‘once in a lifetime’ referendum. Nothing positive or constructive has come from all the discussions held at the time, but this idea of ‘Independence or Bust’. Increasingly, time is taken up in the press, and Holyrood about trivial, or highly-controversial proposals, which have increased the deep-seated divisions in our society. I have seen nothing which could be seen as unifying this nation, of which I am proud to have been a part for over 50 years. It seems to be that there is even a fear growing about declaring one’s affinity for UK unity. The fact that it has worked pretty-well for over 300 years seems to hold no importance in the minds of those who want to divide. Even with increasing powers given to them recently, it has still to be proved whether or not they can handle the responsibility of ruling for ALL the people of a country. Lady of the House, and I have just returned from visiting our Dutch friends from Limburg, in the Netherlands. Whilst they are definitely Dutch, they are only minutes from the German border, and are very close to Belgium and Luxembourg. They very kindly took us round to see as much of these countries as possible. We were treated by all we met with extreme courtesy, interest, and enquiries about why Scotland would want to separate from England, and why the UK would want to cease its involvement in the political life of the European Union. It was only for a short stay, but I sensed a group of people who had become used to each other. It is indeed a Union of many diverse countries, cultures, languages, religions, beliefs, histories, and political agendas, and yet they have each handed-over some of their powers to a central administration, in the interest of ‘togetherness’. Like the USA, it is a family, with all the expected frictions, disagreements, and name-calling which appear within almost all situations where people come together. You never get everything you want, but it is a great lesson in realising that others have a right to be heard, and their opinion might well be more useful than yours. I voted for Ted Heath’s Common Market in the ’70s, and I don’t think we all knew that it would develop so far. It has, however, and we are where we are. Life and time are one and the same thing, a bit like the flow of a river. Reversal is not possible in either concept, and I believe that we must continue to move on or end up in a back-water (to continue the analogy). Even with the various problems with which it is beset, it is vital to be there, using our experience at the political table to continue to modify it for the better, instead of being ineffectively on the side-lines. As if to indicate a confirmation of my views, Lady and I attended a Concert by the RSNO a few days ago, and the final piece was Beethoven’s 9th Symphony, called ‘Ode to Joy’, and the music was sung to words written in 1785 by Schiller. The music was chosen in January 1972, by the Committee of Ministers of the Council of Europe to be the European Anthem of the EU. The words, being German, have no international status, but it is true that they do hold part of the answer to mankind and his dealings with others. Let’s not be known as the generation which threw out the EU with the bathwater of our complacency about what it has achieved. For two generations, in Europe we have had relative peace. Let’s be happy about that, because there are a lot of possible friends out there! There is an element of ‘Follow-My-Leader, right or wrong’ in one area of Scottish politics, just now, which begs understanding. Attempts by the national and international Press and experienced commentators to explain what is happening have failed miserably, never mind indicate to the electorate, as to how it could be influenced. The dramatic rise, and rise, of a Nationalistic Party in Scotland, must be viewed in the light of its inordinate failure to provide any evidence of competence, or co-operation with other countries (except those which have patriotism, nationalism, paternalism, centralisation as their main aim), or belief in discussion within the Party, or regard for other politicians who have a manifestly greater experience in real-politic, or a viable international policy, or a respect for the value of hard-earned tax-revenues, and a life where ‘self-doubt’ is obviously a phrase which does not belong in their vocabulary. To many of us, the last few years have brought gasps of dis-belief in how such a small coterie of people could change, for the worse, a nation whose intellect, art and culture, energy and hard-work ethic, self-sufficiency, ability to settle all over the world, able to negotiate and get-on with people of every class and background made us the envy of the world. And what do we see now? The English-hatred from the SNP which has been stirred-up is un-believable, the inward-looking attitude (manifested in the £26M spent on road-signage in Gaelic), the nepotism which favours relatives and friends over knowledgeable advisers, the misuse of funds to dubious groups, with no Second Chamber to call them to account, the belief that Scotland could defend itself un-aided, in a time of international crisis, and the total absence of forward-looking practical policies except the concept of INDEPENDENCE… Now there’s a word to conjure with in an increasingly-close-linked world! Scotland voted by a substantial majority in 2014 that they wanted to remain within a 300-year old alignment with England, Wales and N. Ireland. That should have been enough, but Edinburgh didn’t listen and still carry-on this demand for an elusive Utopia. For some reason, they are able to convince a sufficiently-large number of crosses on ballot papers that this is how Scotland should be going, with no road-map, or indication what would be at the destination. So why or how has this come to be. We have the right to vote but is this right always properly used? The right to universal suffrage was hard-won, and especially for women. With the value of hindsight, I think we can all agree that it was right and proper, because of the tenet that there should be ‘no taxation without representation’. if you have the Right to vote, something comes with it called Responsibility. You have to use all of heart, head, emotions and pragmatism in thinking of how you use that vote. At one time, we would have voted how our parents voted, or how our friends, workmates, or business colleagues voted. This provided a stable, slowly-evolving, political landscape against which the various parties could display their beliefs and aspirations. It would not have been easy for us as a voter to move out of the mind-set of our environment and circle, or convince them they were wrong without animosity. Now-a-days, we see violence on our streets and in the media against those who would dare to stand against our Scottish masters…very dangerous for democracy. But it is now more imperative than ever to THINK, THINK, and THINK again about how our vote is to be used. We must read, listen, and look at as many aspects as possible about the possible result of the appointment of our parliamentarians on the way of life of our nation. secondly, our elected members must realise firstly that they are the Servants of the people…it is the voters who put them in there and the voters who will eject them. They must learn to listen (which few do), and act on what they hear from all the electorate. And lastly they must accept that taxes and other incomes do not belong to them. They come from the people, belong to the people, and must be spent for the betterment of the people. Retirement has given the Lady of the House, and me, the opportunity to travel round bits of our country at a rate which is bordering on dawdling. Instead of cramming our travelling into a hasty run, we can now turn-off on side roads and let our Garmin ultimately guide us back to our intended destination. Yesterday, on a bright, warm, Autumn day, we had set our course for Tillicoultry. We headed over the River Forth using the old Kincardine Bridge, and went westwards through the back streets of the old village of Kincardine, now a town. We had been through here many times before, over the decades, but yesterday was somehow different. There was a strange nervous expectancy, and the streets had a hushed fear of the future, as we were led along the banks of the Forth. As we were guided northwards, the flat countryside reminded us of our recent trip to the Netherland. But then, the Ochil Hills came into view. There are 60 hills in the Ochils, all over 300 metres. Some of the most spectacular scenery in the Central Belt of Scotland is here as an East-West massif stands proudly as a barrier to the greater hills farther north. But as you drive along the road which follows this range, you suddenly realise how small you are. We partook of afternoon coffee and scones at a lovely farm shop near Blairlogie ( http://www.blairmains.com/farm-shop ) and sat facing directly to the hills. The sun was perfect, the sky was cloudless, the shadows on the face of the hills accentuated the indentations worn by aeons of weather. These hills have lasted for countless years, which makes our threescore-years-and-ten seem miniscule. Their height, extent, majesty, and sheer bulk make us see how we have to ‘fit-in’ with nature, and only succeed when we work hand in hand with our environment. The scenery in which we live does not ‘belong’ to us who live within easy travelling distance . We are entrusted with its care so that those from further away on these islands, and indeed from the rest of the world, can come and enjoy the beauty. Surely it is not too big a step to see that this small country of ours is only part of much-larger groupings, a bit like a Russian doll. We cannot be Independent in any kind of ancient sense, but we can become Separate. Even Clan Munro, to which I belong, had to continually forge alliances to stay in existence. Having done so it produced many great names over the centuries and is known world wide. Our countryside ‘belongs’ to the world, and our country belongs within the Union. As an Irishman who has happily dwelt 52 years in the land of Scotia, I shall be voting on Thursday, to preserve the co-operation within which we have worked instead of breaking-up our extremely-interwoven world. Last week I was pleased to attend a function in Glasgow City Chambers, where long-service awards (22 years+) were being given out to a number of those, who on a daily basis have to deal with some of the worst-behaved people around. I speak of course of the police force of Glasgow who (like police worldwide) face up to the criminal element in our society, and provide a very thin line of defence preventing the breakdown of the civilised society we hold so dear. They were all shapes and sizes, with varying skills in handling difficult situations. No doubt they have all wondered, at one time or another,why they decided to enter and stay so long do this, often dangerous and sometimes thankless, work……but thank goodness they did. I take my hat off to you, ladies and gentlemen, and thank you very much! Lady of the House, and I have had holidays several times in Cyprus, and have just returned from a New Year break there….and very nice it was, thank you, with sun, warm wind, and blue sky! We had always been in the southern, Greek part, and on a previous visit we had driven northwards to the town of Nicosia, to see the Green line. This is simply a barricade in the centre of the town. As the only divided capital in Europe, it kept apart the Greek and Turkish inhabitants. It was not possible to travel across the border a few years ago, but this time, the restrictions had been lifted somewhat, and we were able to cross at a specified area. Visas had to be filled out, and a wait endured, whilst a young, (not un-attractive) lady joined us, presumably to supervise us. And so we crossed into no-man’s land, to be confronted on the hillside facing us, by a massive Turkish flag….I believe it actually appears in the Guiness Book of Records! It’s also quite a good question for pub quizzes! We visited the hillside town of Bellapais, with a magnificent Monastery, along with a little Greek Orthodox Church. 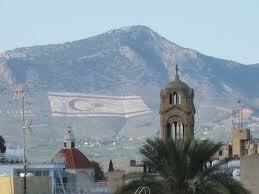 This is not now active, as the Turkish Cypriots forbade its use as anything more than a museum. It was here that one of our party caused a slight diplomatic incident, as the count of people back onto the coach was one fewer than had seemed to get off! We descended into the port of Kyrenia. This was a bit of a pilgrimage for us, as an uncle of the Lady of the House had been a sculptor, and had always said we must go to see Kyrenia. Unfortunately there was little atmosphere about the place, as it was very quiet…so much so that as we found seats at one of a number of harbour restaurants, we could easily have had 20 seats each! Our return over the border was uneventful (but did our supervisor get a reprimand for ‘losing’ one of us?) 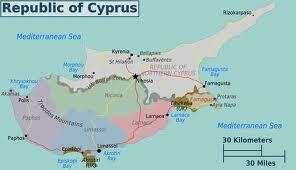 And so we returned to the more ‘normal’ Cyprus that we know. Perhaps if the EU can pressurise Turkey to allow the re-union of this small island it might be a move in the right direction. Any resulting legislative assembly or workable political framework might not be exactly what each side would want, but perhaps some more peaceful and positive compromise might be reached. Such a situation now obtains in the country where I was born, even with a sense of fragility. So perhaps we might yet see the two flags flying together, proudly side by side instead of in an antagonistic way….it’s only a small island, after all! So the bomb that changed the world was dropped 65 years ago. I was but a babe in arms then but I’m sure our parents heard about it with both fear and relief. Relief that it might settle the war, but fear as to what power we were now able to unleash on each other, on this crowded and very fragile world. Now the world is even more crowded and fragile, and we still find new ways of destroying our environment, our fellow-human beings, and our future. Hiroshima wasn’t a turning point; sure it brought to a temporary ending a world war, but it didn’t take long before countless other more local wars took their place in the history of mankind. So let’s not just remember those who died on that fateful day in a previously-unknown city, but those innocent bystanders of all nations who have lost that most precious gift…a right to life. Remember it is governments who not only lead us to war, but send out young men and women to do the dirty work of war on their behalf, whilst they stay at home and justify the war. Funny how potential politicians refer to themselves as public servants before they are elected, and promise to listen to the people; but as soon as they join the House of Commons they become our masters and tell us the laws they enact are for our own good! You would think that we would learn!